Kadabra in game: 662 Who? Important notice! Pokemon Kadabra is a fictional character of humans. Kadabra (Japanese: ユンゲラー Yungerer) is a Psychic-type Pokémon introduced in Generation I. It evolves from Abra starting at level 16 and evolves into Alakazam when traded. From Generation IV onward, a Kadabra holding an Everstone will still evolve when traded between games. Kadabra is a primarily yellow, humanoid Pokémon. It has two large, pointed ears on top of its head, a red star on its forehead, and wide cheeks leading down to a thin snout. Its eyes are deep-set and narrow. Extending from its snout are two mustache-like tufts of fur, with males having longer mustaches than females. Kadabra's torso is segmented with bulky shoulders, a thick, brown chest, and a small abdomen marked by three red, wavy lines. Attached to the Pokémon's abdomen is a large, thick tail encircled with a brown band near its base. Its arms are thin with brown elbows, and end in three-fingered hands with white claws. Its legs have prominent knees and large, three-toed feet, also ending in white claws. 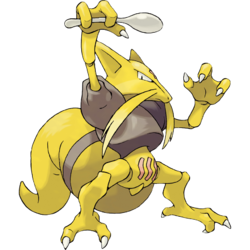 Kadabra is always seen carrying a silver spoon, which amplifies its telekinetic powers. It is able to bend its spoon to use Kinesis, its signature move. Kadabra emits alpha waves strong enough to induce headaches, and can even cause clocks to run backwards, machines to malfunction, and delicate devices to cease functioning altogether. When it has a headache, the alpha waves become unusual. Kadabra can double the amplitude of its alpha waves when holding its spoon, and can increase it even further by closing its eyes. The waves increase further in strength the more danger Kadabra faces. All of Kadabra's brain cells work in unison while it uses its powers. Kadabra lives in urban areas. Sabrina, the Gym Leader of Saffron City, has a Kadabra that evolved from an Abra in Abra and the Psychic Showdown and was used against Ash. After being defeated by Sabrina, and obtaining a Haunter, Kadabra was defeated in a rematch in Haunter versus Kadabra. It was seen again in a flashback in Bad to the Bone. A Kadabra appeared in The Mandarin Island Miss Match. It was defeated in a battle by Prima's Cloyster. A Kadabra was seen in a fantasy in The Rivalry Revival. In Fear Factor Phony, a Kadabra was living in an abandoned mining colony with several other Psychic-type Pokémon. A Kadabra made a small cameo in the "World of Pokémon" opening of Kyurem VS. The Sword of Justice, in which every Pokémon from the first five generations (except Genesect) appeared. EP022 Kadabra Ash's Pokédex Kadabra, a Psychic Pokémon. The evolved form of Abra. It employs powerful telekinetic attacks. In Meanwhile...Vileplume! Like her anime counterpart, Sabrina in Pokémon Adventures also owns a Kadabra, making its main appearance in Kalling Kadabra. 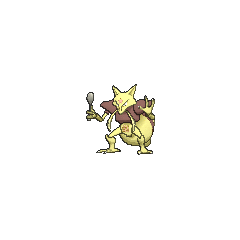 A Kadabra was seen in a Poké Ball at Oak's Laboratory in Cherrygrove in Off Course with Corsola. 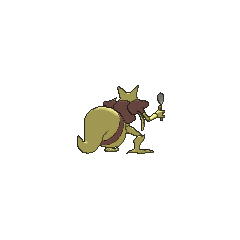 A Kadabra was one of the Pokémon sent to help the fight in Ilex Forest in The Last Battle XIII. Sabrina's Kadabra is a formidable opponent who challenged Clefairy to a magic duel and lost. A Kadabra is seen with Green during the baseball match that took place in Fierce Competition at the Pokémon Baseball Tournament!. 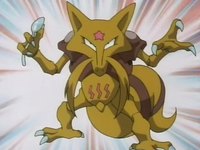 Hareta's Kadabra was seen in Team Galactic's Ultimate Warrior. One Kadabra figure has been released. When it uses psychic power, all its brain cells work in unison to generate powerful alpha waves. A theory exists that this Pokémon was a young boy who couldn't control his psychic powers and ended up transformed into this Pokémon. Kadabra's presence infests televisions and monitors with creepy shadows that bring bad luck. Moves marked with a superscript game abbreviation can only be bred onto Kadabra in that game. 51%-100% HP Let me demonstrate real psychic power! 26%-50% HP Tch! My health has been reduced to half! Level up Ah, fine! I have leveled up! Greater things are expected of me! For other sprites and images, please see Kadabra images on the Bulbagarden Archives. In the Pokémon Red and Blue beta, Kadabra was originally known as Pocus. Kadabra has not been printed as a TCG card since the English Skyridge expansion in 2003. This may be the result of Nintendo and Pokémon Card Laboratories' desire to avoid further litigation from Uri Geller regarding his claim that Kadabra is a parody of him. Due to this limitation, Kadabra is also the only Stage 1 Pokémon that can be skipped by its Basic evolution, introduced with a particular Abra card able to evolve itself directly into Alakazam. For possibly the same reason, Kadabra has not made any anime appearances since Fear Factor Phony aired in the United States in 2006, except a small cameo in the "World of Pokémon" opening of Kyurem vs. The Sword of Justice. Kadabra also did not appear in Pokémon Ranger: Shadows of Almia, whereas Abra and Alakazam did. 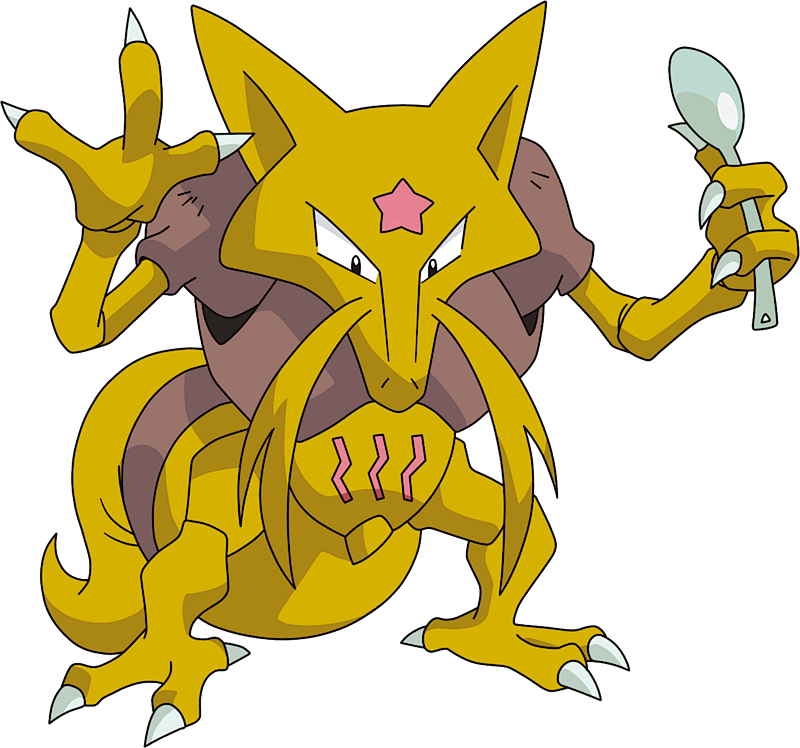 Kadabra is based on magicians and spoon benders. It also shares similarities with goats and foxes, two animals mythologically tied to magic. 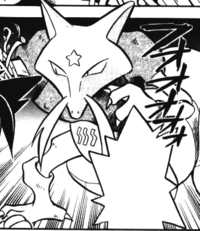 The symbols on Kadabra's forehead and abdomen appear to be references to Zener cards, a small deck of symbols used in experiments to test for extrasensory perception and clairvoyance in the early 1930s. Kadabra is part of an incantation used in stage magic, Abracadabra. It may also derive from the Spanish word cabra (goat). Yungerer is a corruption of Uri Geller (with リ ri replaced by the visually similar ン n), who claims to have the ability to bend spoons with his mind, as the Japanese names of the Abra line are based on famous mystics. As a result, Geller sued Nintendo of America for using his likeness in a character.